Doesn't this card make you smile?! It is just so bright and cheery--I love it! 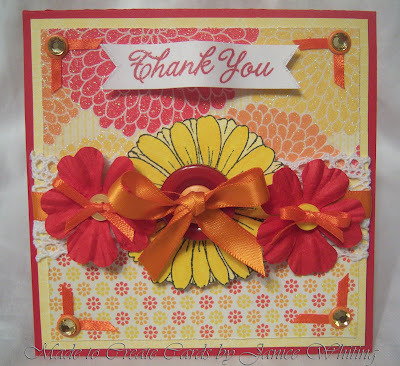 My inspiration came from GinaK's Inspiration 20 over at StampTV. And, again, I'm entering this one into the SSCC #35 as it have some lovely flowers on it! :) The stamped flower image is from Melanie Muenchinger's "A Year of Flowers" GKD stamp set. Cute, Cute, Cute!!!! another great card with beautiful flowers! Thanks again for sharing with us at SSCC. Another beauty! Such bold, lovely flowers and striking color! Thanks for playing again with the SSIC this week!